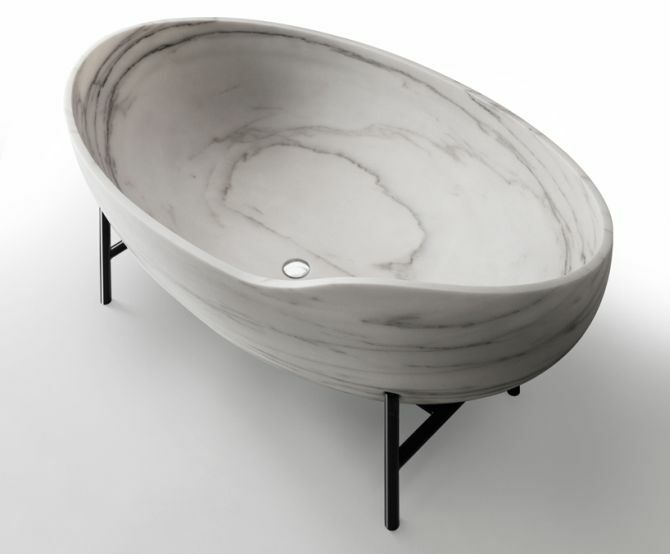 Combining elegance, simplicity and functionality in one design, Kora bathtub by Italian marble company Kreoo cleverly adds some musical touch to your bathing experience. Carved from a single block of marble, the elliptical bathtub is named after ‘kora’- a harmonious musical instrument of West Africa. In bathroom the music refers to the sound of water. This means its hollow shape will enhance sound of water in the tub, making you feel that you’re soaking within some natural pool. Evoking the ancient Tibetan bells, the beautifully crafted piece of bathtub has been shaped with detailed technique, which is achieved by digging the stone. The carving of its structure is done with a specialized technology, and after that it’s handcrafted for fine perfection and finishing. 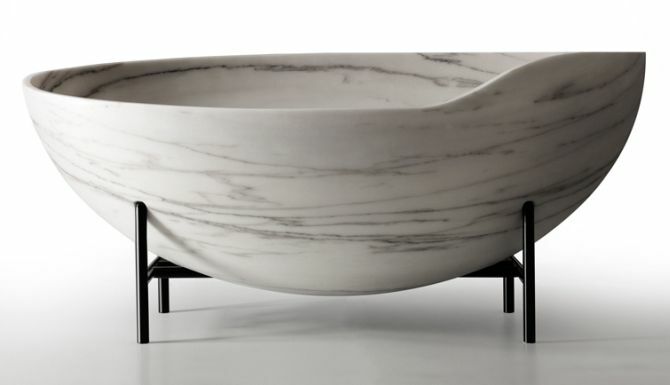 Created with one continual piece of marble, the tub opts utilitarian and simplistic aesthetic- without compromising the functionality of its design. Further, the minimalist yet stylish bathtub is supported by an iron tripod, giving it a feel of floating in mid-air. The metal tripod not only gives stability to the bathtub, but also add striking elegance to the stunning bathroom fixture. Kora bathtub even comes with matching sinks for cultivating beauty of your contemporary bathroom. 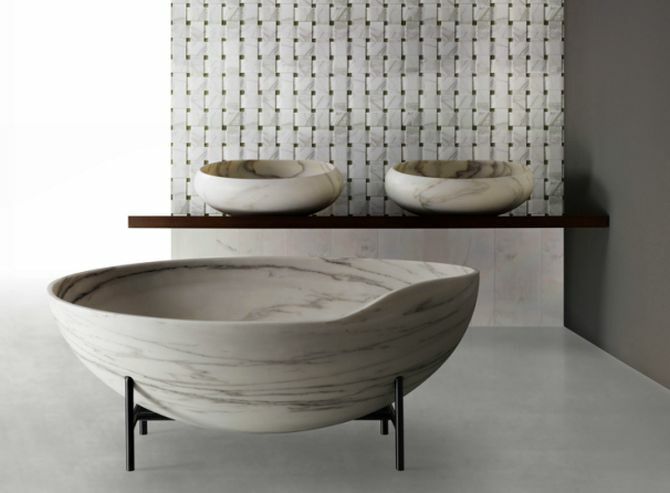 This gorgeous piece of marble bathtub is perfect for any modern bathroom with chic interior. However the tub is not on the market for sale yet, as this gorgeous bathtub will be first presented by Kreoo at Salone del Mobile 2016. At the event Kora will be presented in Bianco Estremoz version, whereas its also available in other colors: Bianco Carrara, Black Marquina and Grey St.Marie. This is not the first time when the renowned marble company has played with stones. Before this we’ve seen the amazing outdoor seating collection by Kreoo. This proves that the firm truly expertise in adding artistic and practical touch to the pieces of rock. These natural pieces of marble can create various useful home decor, as well as functional design, provided these are sculpted with fine craftsmanship.